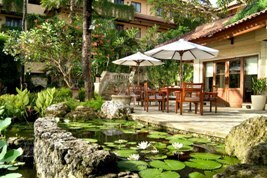 Aston Bali Resort & Spa is 5 star hotel with only luxury inside. 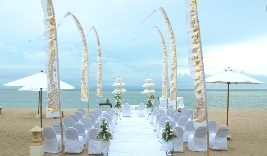 Location on Jalan Pratama 68X, Bali Indonesia 80363 Tanjung Benoa. The hotel is easy to reach from Bali airport, Ngurah rai, about 20 minutes. And not far from Kuta beach, about 25 minutes. Located on the gracious sandy beach on Tanjung Benoa with direct access to the beach. The hotel has even an private beach with excellent facilities and entertainment. Each room is designed with completely luxury and spacious, modern designed, mixture of Balinese style and western comfort and own private balcony. They have also fabulous pools with waterfalls and sunken bar. Anyway this hotel is made to enjoy the luxury and the leisure. They have even special ladies floor, special for the ladies with totally privacy. This hotel has 187 rooms and suites with wide range of color, décor and style. Each has designed with modern and complete facilities. This kind of room is spacious and luxurious with private balcony and spectacular bathrooms with separate bathtub and shower. The interior is mixture of Balinese style and western. 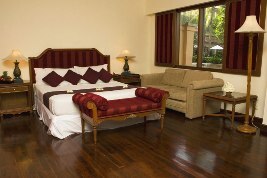 The room has the beautiful view of the lush tropical garden of the resort. 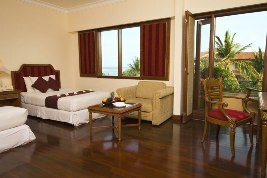 This room has the same size and the same luxury as Deluxe Garden view room. The only difference is the view. If you look out from the window you will catch the spectacular view of the romantic Indian ocean and the private beach of the resort. This lady floor is especially created the ladies who are looking for the completely privacy. So the whole floor is only ladies you can find. Even the staff, the reception, the housekeepers, security and the engineers are female. So if you’re on this floor, don’t looking for some man, you won’t find it. The floor and the room decorated and colored with feminine touch, from beddings, lamps, walls, painting , and beautiful flowers and fruits. The services and room amenities include a direct access to the Biwana Spa with Homemade Spa Bathroom soap, shampoo and salts. The newest redesigned room of the hotel. It has an size 0f 85 square meters of size, impressive isn’t it, pretty big room.. The interior is the mixture of comfort, ethnic and luxury. 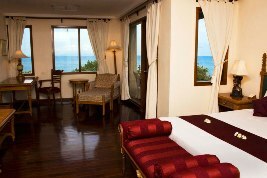 The room has an excellent view of the Indian ocean also overlooking the resort’s tropical garden as well. Especially designed for the family or couples who wants to experience the ultimate luxury and comfort. 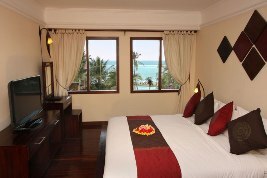 The room has the frontal view of the Indian Ocean and the beach. It has spacious room, about 60 square meters. It has a king size bed, a living room with dining table, two bathrooms and one wardrobe room and has the balcony on the most strategic position to relax and enjoy. The hotel has two of them. 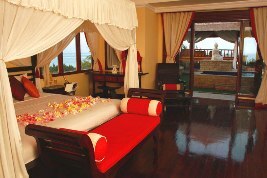 This romantic room is the most highest room at the frontal position with great view of the ocean. It has an private veranda with Jacuzzi and sunbathing deck. 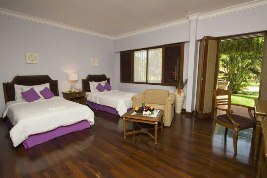 In this beautiful room you’ll find great king size bed and fantastic view from your own veranda. The presidential suite of the hotel. Designed for King of Queens with two bedrooms, living area and own huge veranda, and the most spectacular view. Situated on the north wing of the hotel. The most luxury and facilities of the hotel. Certainly a great room to spend your night. If you want to make a reservations, just take a look of this site, hotels combined. They compare all the prices so you can get the cheapest price. For another packages like honeymoon package or bali discovery package, it’s better if you make directly contact with the hotel itself. 7 nights/ 8 days, an unforgettable romance in the paradise You will be spoiled during your honeymoon with a lot of privacy. 4 days/3 nights the escape of 2 hearts. Enjoy romantic escape with your lovely ones with romantic dinner, spa treatment and much more. 4 days/3 nights. Spoiled yourself by taking this package. I’m sure you will look freshly and get the new energy. 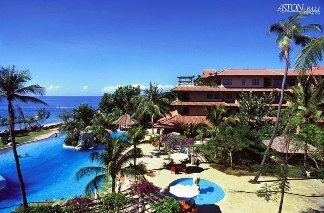 Interested to discover Bali combined with the stay package of this hotel, try this package. You don’t need to worry about the transportation and all other things. Everything would be arrange from the hotel, including Multilanguage guide. and much more. At the end, it cost you less than if you hire a car by yourself, looking for a guide. In fact this kind of packages offer you more to explore Bali, if you don’t know exactly where you want to go. To know more about the exact location and the rates, click here. Would you like to go diving? The hotel offer also the package for this activity including the instructor and insurance. Would you like to know more, click here. Need more advance diving course and certification, choose this package. Click here for the rates and possibilities. Diving in the open water with PADI certified course and accommodation. Click here for more info and rates. There are six unique restaurants in the hotel. 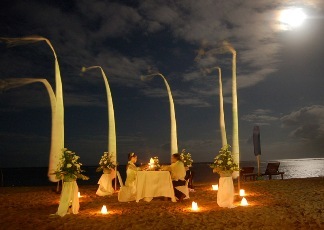 You can enjoy your diner under the stars or at the beach or maybe in the tropical garden. All of them are fabulous, and give you the extreme feeling that you’re really on vacation. Breakfast in semi outdoor restaurant. Enjoy the exotic garden and the view of the ocean. Buffet with many tastes. Need some desert or cocktail after diner? Enjoy them in a classical lounge accompanied by live entertainment. The main restaurant of the hotel. It has a wide variety of cuisine and it has romantic scene on nights with a live band. This place has international menu set on the beach or by the pool. Enjoy your diner under the stars on the beach or by the pool or in the garden. If you like Italian food go to the Fame Italian cuisine of Tanjung Benoa. The hotel resort offer also activities like water sports including water skiing and parasailing. The beach is the perfect location to do the activities. Don’t miss out the great opportunity to experience it.